We are a few weeks away from attending Life Without Instructions in E Rutherford, NJ. I will be hosting a session on deschooling at this conference and I am so excited to go!! 1) Unschooling conferences offer us the opportunity to sit in a room with hundreds of people who are on the same journey as us. We get to find common interests, forge new friendships and play amongst a gaggle of kids who are engaging, independent and free. It is so refreshing. 2) Unschooling conferences stretch our minds to think about our lives and how we might change our mindsets for the better. We are challenged to understand how we can encourage even more freedom in our living and learning. 3) Unschooling conferences let us face our insecurities head on with people who share the common experience. When we can admit to being vulnerable, we can achieve personal growth and personal growth is one of the best outcomes of raising kids let alone raising them consciously through unschooling. 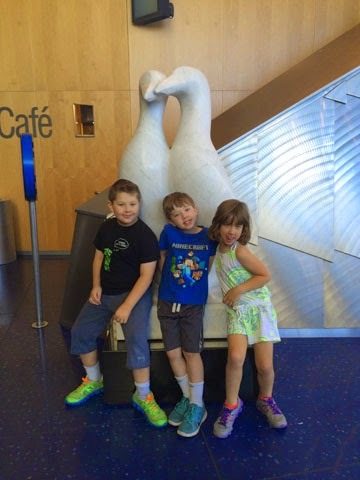 4) Unschooling conferences are fun! There are tons of activities which my kids can engage in or ignore! No one keeps score, no one has issues if my child chooses to stay in our hotel room and play Roblox on a Skype call! There are many different, interesting ways to tap into our creativity and passions. 5) Unschooling conferences give us an excuse to hang out with the friends we've met in our travels to unschooling conferences!! We get more time to develop the kindred spirit that has drawn us together, we have fantastic conversations and we can laugh and cry and create our own kind of family - right there under one roof. There is nothing like it!! 6) Unschooling conferences expand our minds, offer up new and interesting activities and they let us immerse ourselves in the aura of amazing energy. Not much compares! So if you get a chance to go to an unschooling conference, jump at the chance. If you can make it to E Rutherford, NJ for the Life Without Instructions Conference on October 4th through 8th, definitely do so. This conference lineup is epic. The speakers, sessions, fun shops, hang outs and the hosts are the best of the season!! Thanks Julie, looking forward to reconnecting next week! Roblox is truly awesome and my kids just love it. However my eldest just discovered these hacks for Roblox and at first I got worried that he might get into trouble. Fortunately we were assured that it's all good.